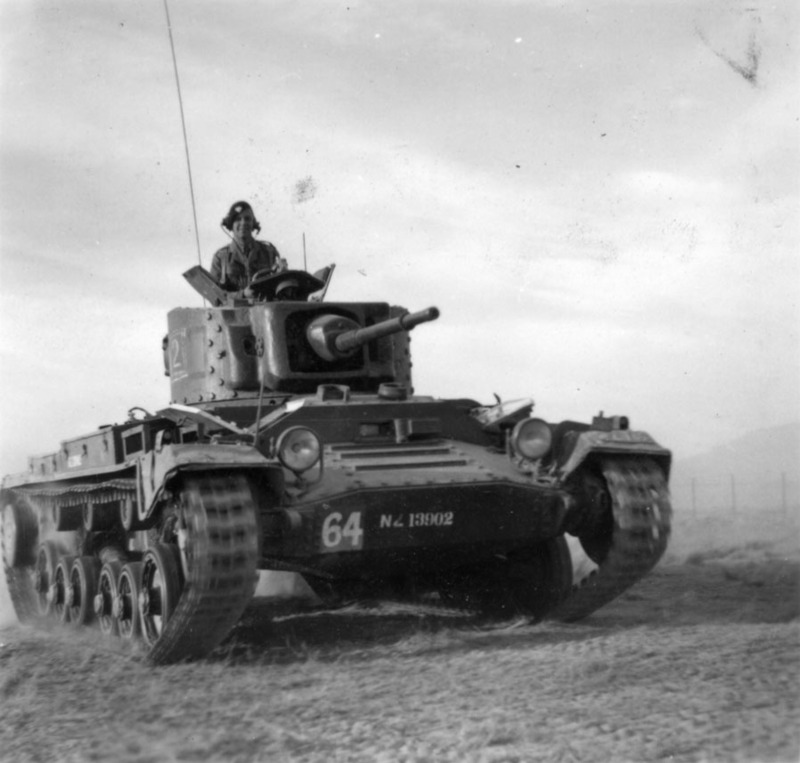 The 1st NZ Army Tank Brigade was formed in October 1941 at Waiouru with the eventual intention of deployment in the Middle East after a period of six months training in New Zealand to provide armoured support for the 2nd NZ Division. Unfortunately the Japanese attack on Pearl Harbour and their subsequent southward movement through South East Asia led to this being postponed indefinitely as the Brigade was required for New Zealand's immediate defence needs. 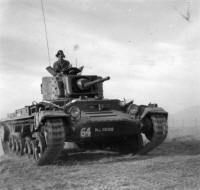 Eventually, under pressure from Freyberg, it was broken up and the individual battalions used to reinforce 4th NZ Armoured Brigade after its formation in late 1942, starting with 3 Tanks (3rd Army Tank Battalion) in December that year, followed by 1 Tanks and then the bulk of 2 Tanks in 1943. The remainder of 2 Tanks was used to form a composite squadron and despatched to the Pacific in September 1943 to provide armoured support for 3rd NZ Division. They fought only one action on Nissan Island in the Solomon Islands group in February 1944 before being returned home and disbanded. 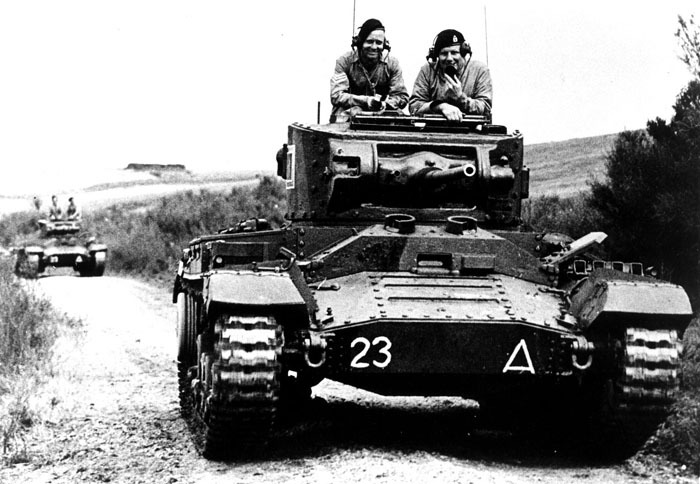 A Valentine V (NZ13902) of 3rd Armoured Regiment at Balmoral Camp in the mid 1950s. The tank would be completed in overall bronze green and the unit serial 64 was in a horizontally divided red over yellow square. This particular tank is from the 2nd troop of B Squadron. A Valentine at Waiouru completed in the marking scheme used by the RF component of the RNZAC during 'Exercise Tally Ho' in 1949. The triangle is believed to be in the RNZAC colours red and yellow, while the unit serial patch consisted of the number '12' in a light coloured square (possibly grey). 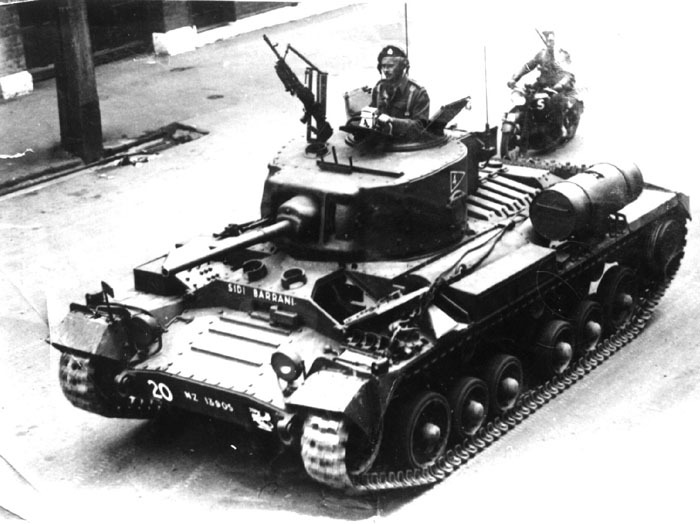 A Valentine Mk V (NZ20767) of Waikato Armoured Regiment at Waiouru in the late 1950s. The unit serial patch consisted of a diagonally divided square red over yellow with the serial number 59. This vehicle eventually ended up in a children's playground in Ohakune. 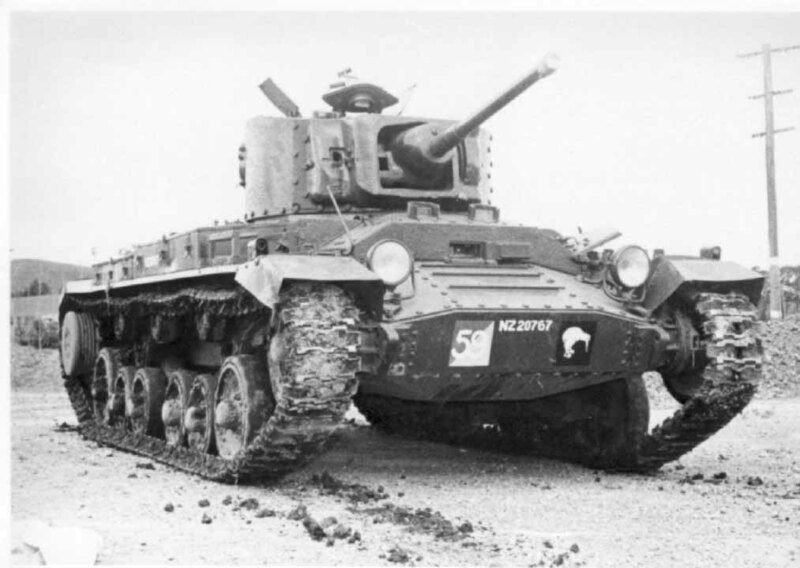 A Valentine II of 3 Tanks during manoeuvres between the 6th and 7th of May 1942 at Waiouru. The tank is completed in the standard Brigade scheme of a base coat of dark green over which is painted dark earth stripes running diagonally across the vehicle from the front right and back towards the rear. At this stage only crude Tac signs have been painted directly onto the camouflage on the glacis plate, without the usual coloured patcre are exceptions). With 5 troops of 3 tanks in each squadron, Troops 1-5 were in A Squadron, 6-10 in B Squadron and 11-15 in C Squadron. 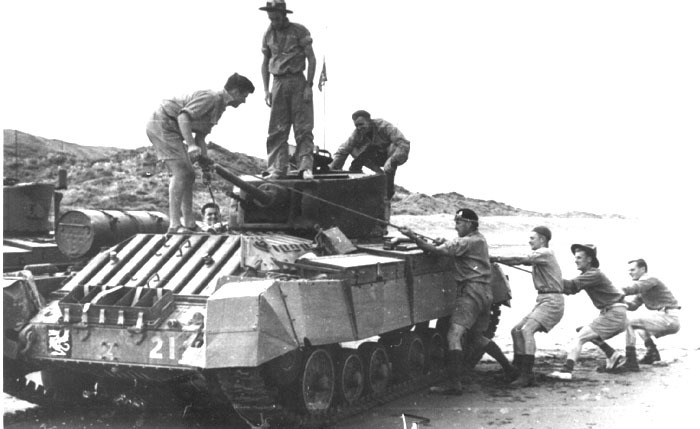 A Valentine Mk V of 1 Tanks on a beach, location unknown, but believed to be somewhere near their camp at Helvetia, sometime after their relocation to Auckland in 1943. The unit now carries the Tank Brigade insignia of a rampant dragon on a black square. A Valentine Mk V (NZ13905) of the Brigade HQ Squadron, now an independent Squadron, in Cumberland Street Dunedin during a parade in 1943. After the breakup of the Tank Brigade this unit, known as the Army Tank Squadron Group, was sent to Southern Military District where it was based at Harewood Airport near Christchurch. The unit serial insignia was 20 in a brown square and the unit also used a style of markings on the turret involving the use of pennants, this tank carries the number 4 in a simple triangular pennant. The tank name is "Sidi Barrani". A Valentine Mk V of 13 Troop, C Squadron, 1 Tanks at Waiouru in 1942. 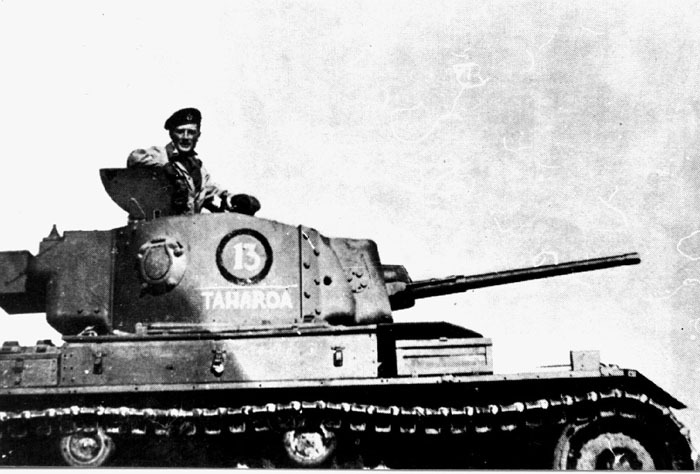 1 Tanks was one of the few New Zealand armoured units that used a systematic naming system for its vehicles employing Maori names beginning with K for A Squadron, Ng for B Squadron and T for C Squadron; in this case "Taharoa". The use of white troop numbers (and not the unit serial patch colour) in this vehicle and other Valentine Vs in 1 Tanks, coupled with the fact that the 3-man turreted tanks were favoured for troop leaders suggests that the white number was used to distinguish troop leaders in this unit.